Deep Root Fertilization in Fort Worth, TX. Tree Care Pros provides deep root fertilization in Fort Worth, TX to help and improve the health of trees that are lacking needed nutrients. Contact us today, (817) 402-2055, to schedule a free diagnosis and treatment of your trees. We have a number of services to diagnose and treat your sick trees. 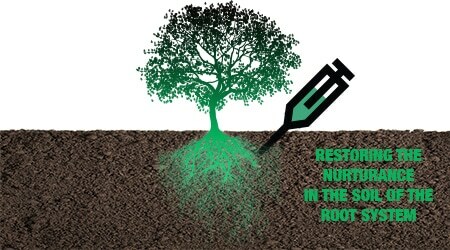 Our main treatments that the majority go with are tree injections a way to implement injections through the deep roots. This feeds your tree nutrients or a number of other substances that it may need after evaluating your trees status. The main nutrients that are implemented in the feeding are NPK which is nitrogen, phosphorus, and potassium. These boost up the trees healthy lifestyle tremendously but sometimes these nutrients aren’t all necessary to the tree. Our staff will evaluate the status of your trees and keep you informed about what is needed. Many tree service companies recommend this process for fertilizing and bringing back life into your tree. Does it work? 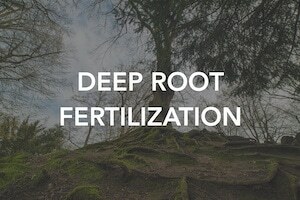 Does deep root fertilization work? 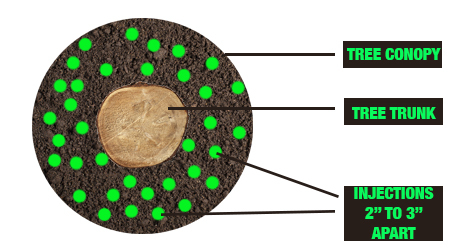 Deep Root Feeding processes are not necessary but in some cases they are. The first two to eight inches from the ground down underneath the tree are the most important part where the nutrients take effect with this it penetrates and absorbs the treatment. When applying this, you have to have the proper equipment to conduct such procedures. Furthermore, keep in mind these key points when arborist is acquiring injections. Keep Injections separated 2″ to 3″ apart from another. So an arborist will be required to do the service. Contact Our Certified Arborist Today! If your trees are looking sick or unhealthy, contact Tree Care Pros for a tree health diagnosis. If the trees are lacking important nutrients then we have the solutions you need! Call us at 817-402-2055 and get a free estimate. If you need deep root fertilization in Fort Worth, TX or the surrounding area. You can count on Tree Care Pros for professional tree care and maintenance of your trees. Updated on November 8, 2018 at 12:43 pm By Tree Care Pros.